When you first start gardening, every harvest is a miracle. Over time, this abundance becomes normal, as evidenced by the recent lack of vegetable pictures posted to this blog. Every once in a while, however, you get a pleasant surprise. In this case, it’s the heirloom zucchini (courgette) “Costa Romanesque” that I obtained as seed from Green Harvest. We’ve already had five of these ribbed monsters, which have a beautifully soft flesh, great for pan frying. I’ve also shredded several of them, then blanched and frozen them for later consumption. This entry was posted in Growing our own food and tagged courgette, summer, zucchini. For a long while now I’ve wanted to do two things: grow sweet potato (kumera), and have vegetables in the guerrilla gardened land behind our house. When I stumbled across the book Straw Bale Gardens, it seemed like the perfect answer to both desires. Straw is the bundled stalks of harvested wheat, and it acts like, well, straws, sucking up and holding onto moisture. I sourced six bales from the friendly folks at Kensington Produce, piling them into my ute. Six bales, laid out in their final position. The concept is a simple one: lay out a number of straw bales, with the ‘spiky side’ facing upwards. These act as the base of a no-dig garden bed. For the first two weeks, the straw bales get a few handfuls of fertiliser each day, and plenty of water. This kicks off the breakdown of the bales (straw by itself has very little nutrient). 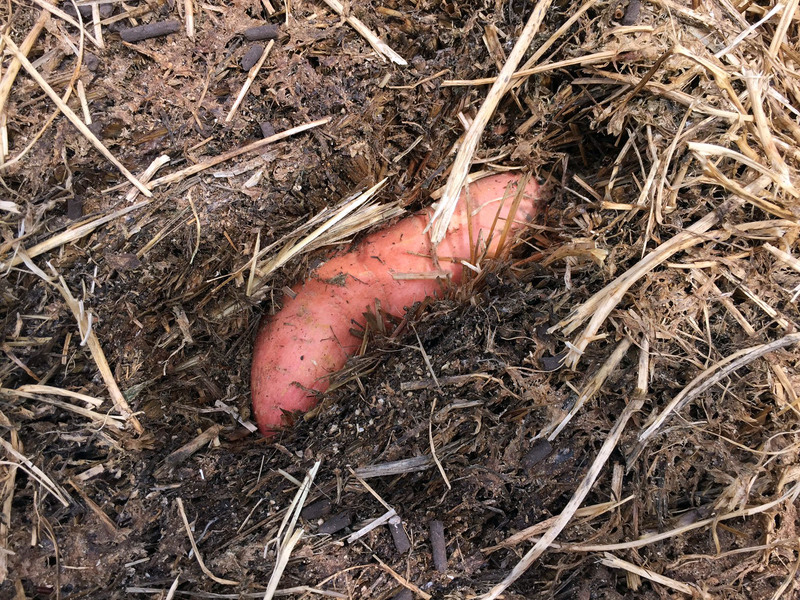 A sweet potato (kumera) nestled in the straw. Before planting anything else, I nestled a number of sweet potatos (kumera) into the straw (these babies are the main reason I created the garden). In theory I was supposed to let them shoot first, but I couldn’t wait — fingers crossed it works! A soaker hose laid across the straw bales, with the start of a layer of planting mix. A soaker hose was then laid out across the bales, and then the bales are covered an inch-thick layer of potting mix. I then planted seeds of a mix of different quick-growing vegetables, including lettuce, green beans and amaranth, plus some strawberries. The straw bale garden fully set up — now I just have to wait for the seeds to sprout. The straw bales are already encouragingly warm, so hopefully this will encourage seed germination. I’ll report on progress over the next weeks and months. As a final note, I’d strongly recommend the Straw Bale Gardens book. It’s a simple concept, but clearly and powerfully communicated. Joel’s garden design is more evolved that the simple version I’ve created, so I’d encourage you to get a copy and start planting! This entry was posted in Growing our own food, Guerrilla gardening and tagged amaranth, Guerrilla gardening, kumera, lettuce, no-dig gardens, straw, straw bales, summer, sweet potato. As a result of a mention in New Scientist, I stumbled across the Open Source Beehive project, which aims to do two things: create simple plans for bee hives that can be used by all, and to design sensors that can monitor the hives. The core of the project are plans for both Warré and Kenyan (Colorado) top-bar hives that can be cut out a single sheet of plywood. The hives are designed to be produced using a CNC (computer-controlled) cutting machine. I loved this idea, as it brought together two of my passions: beekeeping and technology. Kenyan (Colorado) hives are different from traditional hives in that they run horizontally, rather than vertically. Shaped like a horse trough, the bees draw comb on simple top-bars that run across the hive. I downloaded the plans, and sourced a local company who could cut the pieces, the very friendly Big City Productions in Alexandria. The CNC cutting machine in action, creating the pieces for my hive. It’s an amazing thing to see the the fully automated machine work across the sheet of ply, cutting out even the most intricate of pieces. An hour later, the hive was completed. The total cost, including the cost of a sheet of eco-friendly hoop pine ply and the use of the CNC machine, was about $400. The result is a pile of pieces that beautifully slot together without screws or nails. All that was left to do was to protect the hive with a few coats of linseed oil. The fully assembled Kenyan top-bar hive. Only a few weeks later I received a call about a swarm of bees in Ashfield. Hanging from a tree directly beside the footpath, this was a big swarm. It was also rather protective, as attested by the multiple stings I receiving while catching the swarm in a box. While waiting for the bees to all follow the queen into the box, a mother and her kids walked by. After congratulating me for “looking after the bees, as they’re dying out”, she casually mentioned “and you know about the wild hive?”. Um, no? Bees flying into their wild hive in the trunk of a tree. Just a dozen metres away, on a major road, she showed me a lovely wild hive in the rotted-out trunk of a camphor laurel tree. I think I caught the prime (first) swarm from this wild hive. The bees climbing up a white sheet, into their new home. Amazing! I took the swarm home, and shook it out onto a white sheet, leading up to the entrance of my new Kenyan top-bar hive. What happened next is one of the true wonders of nature: the bees started climbing the sheet, and once they found the entrance to the hive, they started streaming in. Tens of thousands of bees, all piling into the hive, within the space of 20mins. Amazing! Bees flying into the new hive. From the outset, the hive proved to be incredibly vigorous. Within a few days it was foraging as strongly as my 18-month-old main hive. When we opened it up a fortnight after it was established, half of the entire hive was brood. Within just a few more weeks, it was completely full of drawn comb. That’s the good news. The bad news was that the hive was very aggressive, attacking me the moment I opened up the hive. It also had a nasty tendency to sting people when they were just walking near the hive. While the hive was placed in the land of the former convent, well away from people, it came to the attention of the church. Who — not unreasonably — asked them to be moved to a new home. The hive in the back of my ute, on its way to a new home. By amazing coincidence, a cousin had just completed a beekeeping course, specialising in top-bar hives. (What’s the chances of that!) Living on the far South coast, he was looking for bees to get him started. So at Christmas I took the hive down South, in my new ute. Where it was handed over to my cousin, for the rest of the trip to its new home in the trees. My top-bar hive, in its new home amongst the trees. I’m pleased to see the hive end up in the hands of someone passionate about natural beekeeping, in such a lovely bushland setting. The idea of creating a hive from a sheet of plywood is a great one, and the open-source plans worked well. Since the creation of my hive, the Open Source Beehives project has continued to evolve the plans, resolving a few issues with the original design. Would I recommend others to use these plans? Absolutely, yes. The bees bearding at the front entrance of the hive, within a month of the hive being established. The only proviso is this: in Australian conditions, the Kenyan hive is probably too small. It has the interior volume equivalent to 2-3 Warré boxes, which isn’t a lot. Within 6 weeks of my hive being established, it had already re-swarmed. This was no doubt due to the large size of the swarm, and its strength. I suspect it won’t be the last time it swarms this season. I’ve suggested to the open-source folks that they consider creating a larger version of the Kenyan plan, perhaps cut out of a couple of sheets of ply. We’ll see if they take up the idea. While I haven’t ended up with a top-bar hive, it’s been an incredibly interesting journey, from cutting and assembling the hive, to catching the swarm. I’ve documented this in the video at the top of the post. Enjoy! This entry was posted in Beekeeping, Making our own and tagged CNC machine, Colorado hive, Kenyan hive, natural beekeeping, open-source, summer, swarm, swarms, Top-bar hive, Warré hive. Dianella caerulea (blue flax-lilly) produces bright blue/purple berries. We’ve extensively planted Dianella Caerulea (Blue Flax-Lilly) throughout our native back garden, and in our verge gardens. It’s tough, drought hardy, and fast growing. It also produces delicate blue flowers, which then grow into bright blue/purple berries. These are a native bush food, with an enjoyable flavour. These are a native bush food, with a pleasant, if not overly strong flavour. One afternoon’s modest harvest of berries. I picked a good harvest of them one afternoon, supplemented by takings from our raspberry and blueberry plants. Mixed berries with yoghurt and honey from on own hives. Together, they made a delicious dessert, when combined with greek yoghurt and our own honey. A feast for both the eyes and mouth! This entry was posted in Growing our own food, Native gardens and tagged blueberries, bush food, dianella, honey, native gardens, native plants, raspberries, summer. A few years back, our neighbours from down the road offered us a few pieces of tumeric from their recent harvest. Following the “why not, let’s give it a go” principle, I planted these into two potato bags. They grow vigorously, as the photo above shows. Following instructions on the net, I let them die back over the first winter. They came back strongly during the following summer, and when they died back for the second time, it was time to harvest. And what a harvest it was! The easiest way to harvest the tumeric was to up-end the two potato bags, and to rummage around in the soil. As you can see from the photo above, the tumeric emerged as thick clumps of bright orange tubers. In all, we harvested 2.6kg of tumeric (! ), which sounds like a lifetime supply to me. Half has been peeled and frozen, for long-term use. The other half has been stored in the cool cupboard in a sealed container. We’ll see how both lots go over time. This entry was posted in Growing our own food and tagged summer, tumeric, winter. Our rosella plant in flower. When I was at the Council nursery a while back, they asked me “you know about plants, right?”. When “um, sure” was the answer, a rosella plant was pressed into my hands. Ok, now what do I do? I had, of course, heard of rosella, and rosella jam in particular. A bit of reading uncovered that rosella is a fast-growing summer plant, reaching 1-2m in height. The bright red calyx is what’s used for jam and other cooking. True to expectations, it proved to be very vigorous, and I harvested the fruit this weekend. It’s actually the red calyx — which surrounds the green internal seedpod — that’s used in cooking. A basket full of rosella calyx. I was able to get a modest harvest of about half a basket (perhaps 50 calyx). Following some excellent instructions on how to make rosella jam, I spent the evening simmering and sieving, while watching TV. A small amount of rosella jam. The results were a little over a jar of rosella jam, which was transformed from the bright red calyx into a deep red colour. And the taste? Think strawberry-meets-rose, distinctly different from any other jam I’ve tasted. Delicious! This entry was posted in Growing our own food and tagged jam, rosella, summer.